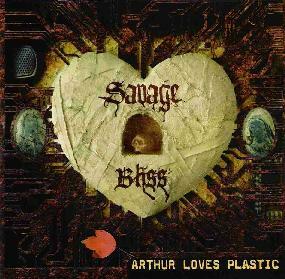 Arthur Loves Plastic - "Savage Bliss"
Bev Stanton, aka Ms. Arthur, is the mainwoman behind this project. It's not quite what I'd call progressive techno, but there's a fair deal of space here, as well as a number of catchy tunes with interesting vocals, and more collaborations, re-mixes and songwriting-substantive samples than I'm ready to detail in full. "World Control" is classic space-techno with the usual tronics, loops and vocal samples, dancy but out-there (though all the tracks on the disc are within the 3-4 minute range, so things only go so far). "Ecstacy" has some amusing samples, but musically is a little too cliche in terms of techno-pop. "You're a Champion" has a collaboration/sample involving an outfit called 2 Skinnee J's which is worth a mention as there are unusual and engaging raps by several different guys (more than two), over a catchy dub/drum'n'bass tune. "Monuments" I can definitely not get into at all, way too poppy... uh... grunge-techno-hop that gets too whiney, and a few too many techno-pop loop cliches in the mix. "Queen of the World" is pretty cool, kinda '80s electronic new-wave musically, with angry establishment-defying vocals from Heather Heimbuch. "Don't Push" has another female vocal that is interesting and a bit foreign to my ears... maybe this is more blatantly in reference to the "lesbian scene" of which I am ignorant, but which is apparent at least in the bio-material sent. "Persona Non Grata" is a relationship-based femme-vocal tune which segues very nicely into the cosmic instrumental beat of "Illusion". "Worst Place in the World" closes the album and has a darker nature than the rest of the album, space-techno with some creepier keyboards. Overall, I say this is very relevant, egalitarian, pop-genre embracing stuff, more than I prefer at times, but valid stuff, with some nice space-dancey moments.